Put all the water on this planet into a single sphere and it would have a diameter of about 860 miles, says the United States Geological Survey. For reference, that's roughly the distance between Salt Lake City, Utah, and Topeka, Kansas. About 70 percent of the Earth's surface is water-covered, and the oceans hold about 96.5 percent of all Earth's water. But water also exists in the air as water vapor, in rivers and lakes, in icecaps and glaciers, in the ground as soil moisture and earthgwaquifer.html, and even in you and your dog. Still, all that water would fit into that "tiny" ball. The ball is actually much larger than it looks like on your computer monitor or printed page because we're talking about volume, a 3-dimensional shape, but trying to show it on a flat, 2-dimensional screen or piece of paper. 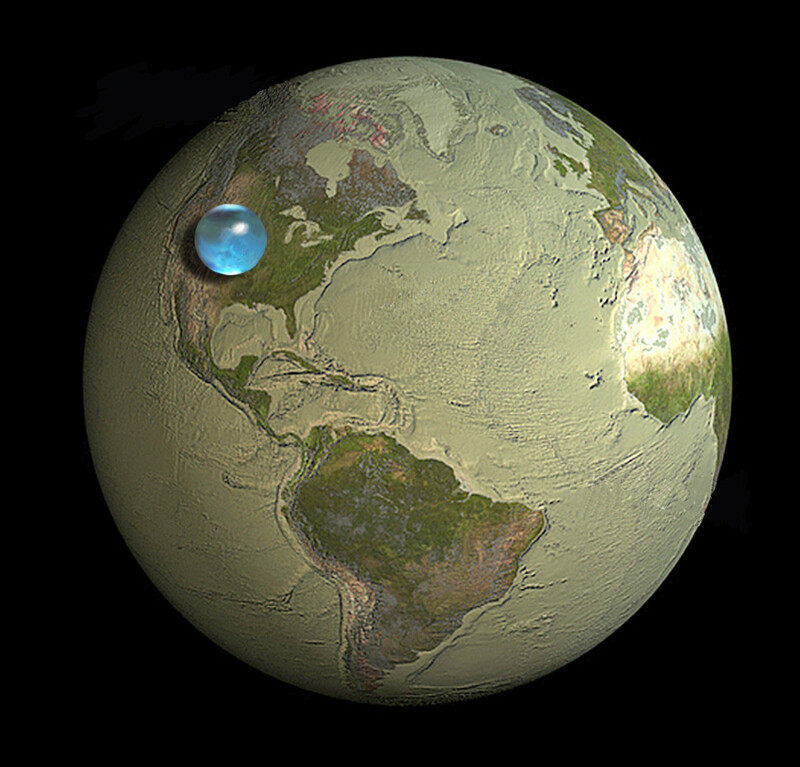 That tiny water bubble has a diameter of about 860 miles, meaning the height (towards your vision) would be 860 miles high, too! That is a lot of water. I really like this illustration because it shows off an important concept: Whether a number represents "a lot" of something or "a little" is pretty damn relative. As the USGS says, that is, in fact, a lot of water. But it also makes for a surprisingly little ball. Read more about this graphic and the water cycle on the USGS website.